Just a 10 minute drive (or 3 train stops) from the town of Appenzell is the Wasserauen-Ebenalp cable car station. Across the street is a large (FREE!) parking lot which is where we left our car for the night. We took the cable car up to the Ebanalp Station (20CHF, 1 way) where we checked into the guesthouse and enjoyed a relaxing evening of short walks and gorgeous views. Because we were traveling mid-week and in between the winter ski season and summer hiking season, we were fortunate to have the entire guesthouse to ourselves! However, most won't be as lucky, so be sure to make a reservation beforehand. Note: Last cable car trip up departs at 16:45. In the evening half a dozen Birkhuhn or Black Grouse came out to show off their plumage while we watched from the guesthouse restaurant. The cordon bleu and Käse-Hörnli were both made with local Appenzeller cheese (YUM!). After staying the night and enjoying a traditional Swiss breakfast at the Guesthouse Ebenalp, we grabbed our backpacks and began our hike down the mountain. 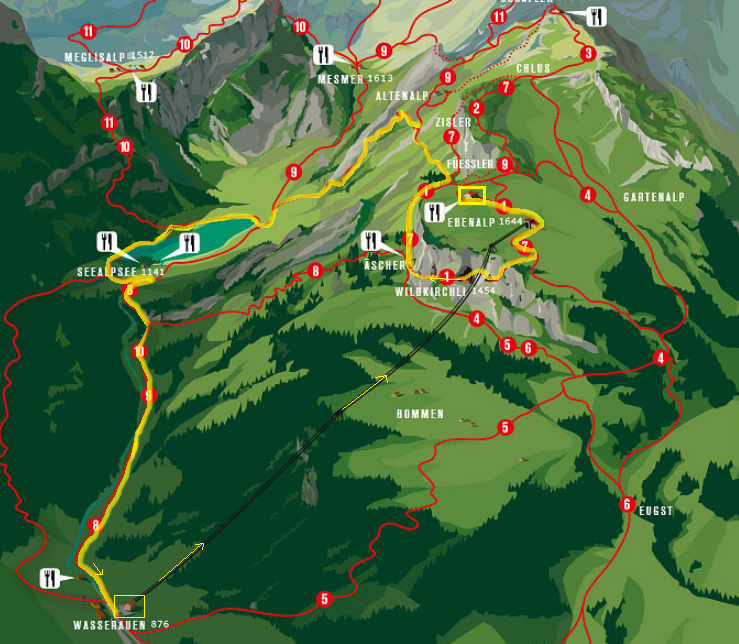 We took the yellow highlighted route on the map below which led us through the cave, past the Wildkirchli & picture perfect Äscher guesthouse and cafe. The trail then continues along side the cliff above and further up the valley. We took the cutoff trail down to the valley floor and Seealpsee lake. Stopping for a quick lunch break, we marveled at the awesome wildflowers and stunning blue color of the lake then continued down the trail to our starting point at the parking lot across from the Cable Car station. The hike took us approx. 4 hours to complete, including our lunch break.